Gillet is a Belgium-based exotic car manufacturer with a flair for eye-catching design. 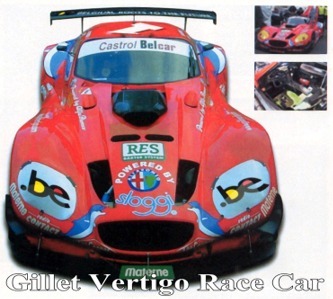 Race car driver Tony Gillet, who achieved racing success on Belgium's hill climbing races, founded Gillet in the 1990's. The company's signature car, the Vertigo, is not only a GT race car, but it also holds the 0-62.5 mph speed record - achieving that feat in just 3.266 seconds. The first Vertigo prototype appeared in 1991 and made the rounds at several major car shows. After passing a battery of European car safety tests, the Vertigo was ready for production. It was officially unveiled at the Brussels Auto Show in January of 1994. The Vertigo is 100-percent race car, with a wildly designed carbon-fiber shell - the same technology used in F1 cars. A 24-valve Alfa Romeo V6 powers the latest version of this vehicle with 3.0-liter displacement. It churns out 166 kW @ 6,200 RPM, and boasts a maximum torque of 275 N-m @ 5,000 rpm. The car has plenty of kick, with 0-60 mph time of less than 4.5 seconds, and a top speed exceeding 150 mph. However, the race car engine has been "tweaked" to churn up to 35 hp. The chassis is a unique mono bloc structure composed of nomex/carbon, which gives the car strength without adding excess weight. It has independent rear wheel suspension - and MacPherson struts both front and back. If you can't already tell from the impressive styling and aggressive stance, the Gillet Vertigo is designed to WIN races.